I took these pictures last Fall and then uploaded them to a new post. And that is where they sat for the next several months. Every time I would sit down to write a post to go with these photos my mind would turn up nothing. I figured something would come to me during December’s Cookie Month, but no. Just before the New Year my step-dad called to tell me that he is publishing a book of poetry this coming Spring. My first thought was “Well, it’s about time!” Dave has been writing poetry my whole life. His poems are thought-provoking and emotional with a with a touch of playfulness and/or irony. They make you think, to search your inner depths and question previously held ideals. Often they thrust you back into your most closely held memories of home, hope, love and loss. I told Dave of my recent troubles with writer’s block and he told me he had just the thing for me. He read me one of his poems called Hesitation. After hearing it I asked him if I could share it with all the writers out in blog land and he agreed! So without further adieu, this is Hesitation by D.R Ostman. I hope it chases away your writers block like it has helped chase away mine. With hesitation, I touch the pen to page. shall I write about today? Words and subjects all knotted up; like a child’s tangled kite that wont fly. Focus, focus, instead questions, much like a cup half-full, with confused expectations. Where do I start and where do I end. I knew before I started, it was all in my head. of my unsure and hesitating mind! One request from the author. Please do not take this poem and repost it anywhere else without sending me an email and talking to me about it first. If you do I will request you remove it immediately because of its pending publication. If you like the poem, we would love it if you could direct your friends back to this site to read it. I will let you know more about Dave’s book as I get it. Thank you for respecting the author’s wishes! The recipe is the same as the original except I use a hand mixer instead of a food processor like Rick does. 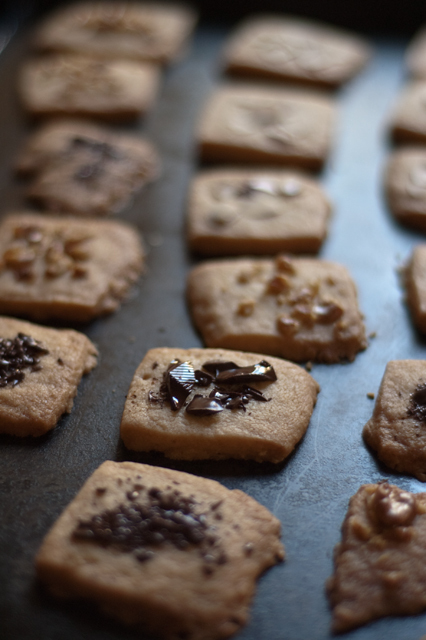 Optional toppings – 1/4 – 1/3 cup of any of the following: finely chopped chocolate, nuts, seeds, dried fruit, candy sprinkles. 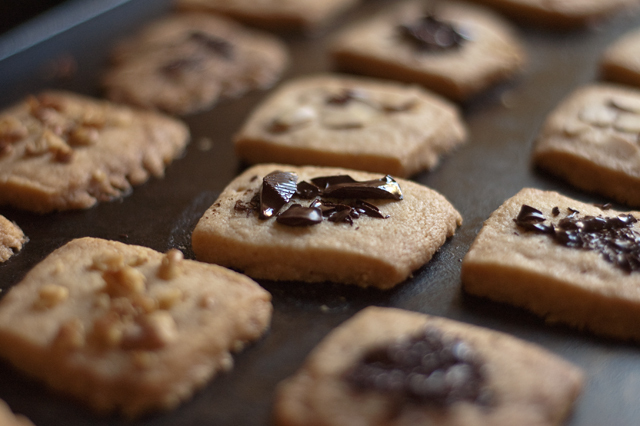 You could also just bake them plain and then sprinkle with cinnamon or other spices. 1. In a large bowl mix together the flour, salt and sugar. Add the butter and blend with a hand mixer, stand mixer or food processor until crumbly. 2. Dump the crumbly dough onto your work surface and shape into a ball. Place the ball between two sheets of plastic wrap and flatten the ball into a disk. Roll out to 1/4 inch with a rolling-pin while it’s between the plastic wrap. Transfer to a cutting board or cookie sheet and refrigerate for 30 minutes. 3. Heat oven to 350 degrees F and place oven rack in the middle. 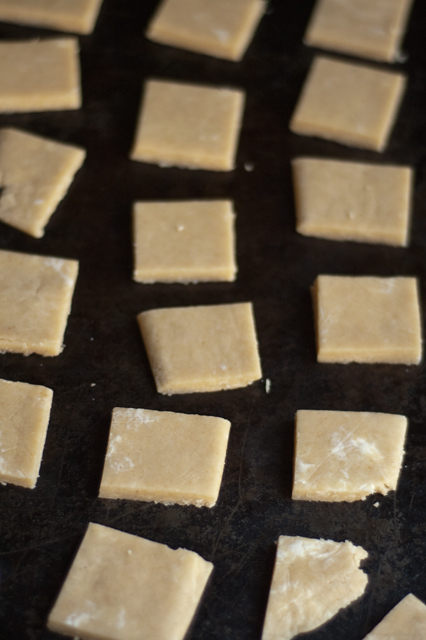 Cut dough into squares or triangles and place 1 inch apart on an ungreased cookie sheet. Sprinkle tops with chosen toppings and gently press in. 4. Bake 15-17 minutes or until lightly browned. Turn the baking sheet halfway through cooking. Cool on the cookie sheet for 2 minutes then transfer to a wire rack to cool. This is also a good time to sprinkle them with cinnamon and sugar. love the poem…and the reicpe.